Great ranch home on the mouth of Far West and West Canadian Lake! 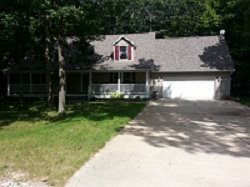 Has nice open living space so everyone can enjoy each other, great deck that overlooks the lake and a nice yard. Home does not have a sandy beach but if you wanted you can swim there, it has a nice dock for your enjoyment to throw a few fishing lines out also! 3 bedroom / 2.5 baths it also has cable TV and WiFi for your enjoyment!